It’s not a silly question. Your health is one of the primary factors that life insurance providers take into consideration when calculating the premiums they charge those that they insure. Since runners are usually in better physical health, it only makes sense that they should pay less for life insurance, doesn’t it? Do runners pay less for life insurance? The answer will delight you, because it is a YES! As was mentioned above, one of the biggest factors that life insurance providers take into consideration when determining premiums is the health of the individual they are insuring. With that said, the better health you are in, the lower your premiums for your life insurance will be. Here’s a look at how running improves your health, and how it can help you save on your life insurance policy. The health of your heart plays a huge role in your overall health. The healthier your heart, the less likely you will suffer from certain health conditions that could shorten your life span. Running improves your heart by strengthening its muscles, which, in turn, increases the amount of blood your heart can pump every time it contracts. The more blood your heart pumps, the more blood your other vital organs receive, which means better health overall. Add to that the fact that running actually reduces the risk of coronary heart disease by as much as 4.5 percent, and this activity is definitely hearth healthy. Because the health of your heart has a huge impact on your overall health, it is something that health insurance providers take into serious consideration when calculating premiums. In fact, the health of your heart is a primary concern that your health insurance carrier will take into consideration when reviewing your application for coverage. The company will look for any signs of heart disease, and since running can reduce your risk of heart disease, you will likely see a significant savings on your health insurance premiums. Another major benefit of running is lower cholesterol. In fact, runners are 4.3 percent less likely to develop high cholesterol than those who don’t run. How does lower cholesterol impact your life insurance premiums? When life insurance providers are assessing your health while they are determining your coverage, they look at your total blood cholesterol level and your cholesterol/HDL ratio. High numbers in either of these areas put up a red flag for insurance companies because they can signify a current problem exists, or that there is an increased potential for problems with your health in the future. As a result, if you have high blood cholesterol levels or high cholesterol/HDL levels, you will end up paying more for your life insurance. Because runners have lower levels of both, they can experience a significant savings. Another huge benefit of running is controlled blood pressure. Running actually reduces your chances of having high blood pressure by as much as 4.2 percent. How can low blood pressure impact the amount you pay for your life insurance? Your blood pressure readings are actually a key factor that your health insurance provider will take into consideration when calculating the amount you will pay for your premiums. They will assess you systolic and your diastolic numbers, and if either of these numbers are outside the normal range, the insurance company will calculate a higher price. It’s no secret that running provides better weight control. Running provides increased improvements I body mass index than other physical activities, like walking. Why is this an important factor that life insurance companies take into consideration when determining the rate you will pay for your life insurance? Because your build, or your height and weight, is a key factor that is taken into consideration when determining your eligibility for receiving coverage. Adding even as little as 20 pounds to your weight can have a huge impact on your premiums. So, since running helps you keep your weight under control, it can also help you save on your life insurance. Many experts agree that running can actually reduce the risk of developing certain diseases and medical conditions that can have a huge impact on your quality of life. Runners, for example, are less likely than non-runners to develop diabetes, osteoporosis, stroke and even certain types of cancers, such as lung, colon and breast cancers. How does this provide you with cheaper rates on your life insurance? Because all life insurance companies take the past and current medical conditions of the people the cover into consideration when assessing an application, certain health conditions will increase your rates, or could even result in having your application for coverage declined. 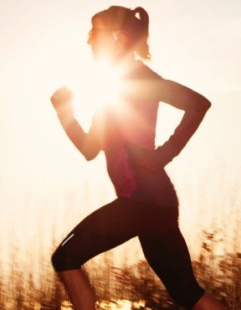 Running is an excellent way to reduce stress levels. It releases endorphins and other chemicals in the brain, which reduces stress levels. How does your stress level impact your life insurance premiums? Stress can impact the human body in a number of ways. It can increase blood cortisol levels, which has a negative impact on cognitive performance, blood sugar levels, blood pressure levels, the function of the immune system, and several other key areas that impact your overall health. Given all of the incredible benefits that running provides, it’s no wonder why runners can enjoy a significant savings on their life insurance. If you aren’t a runner yet, get started! You could actually start to see a significant increase in your overall health, which could directly impact your health in a positive way, and save you a significant amount of money on your life insurance.